Knowing and controlling the micro-economics of the production floor is increasingly becoming vital for manufacturing organizations. This requires mining locked knowledge which is deep inside the machines and equipments on the production floor and converting them into actionable knowledge reports in real time. 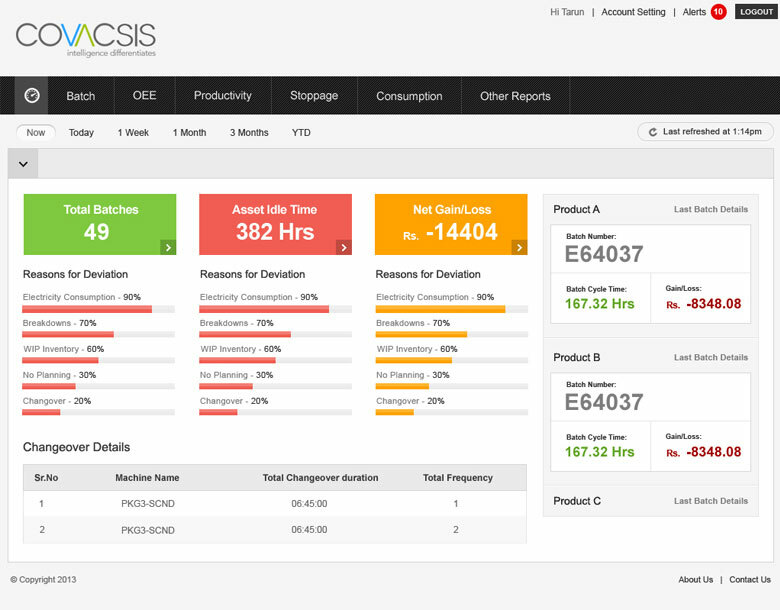 Covacsis helps redefine the sustainable economics of the shop floor, for a variety of departments across the organization. Our flagship solution IPF is being widely appreciated by manufacturing companies across sectors. Agnostic to machine/controller: IPF is a first of its kind solution that extracts data from any machine installed on the shop floor irrespective of its make and model. Internet of Things: IPF is the only industrial solution in the world which follows principle of IoT and connects all the disparate machines on the shop floor. IPF - organizing and analyzing large sets of data extracted from disparate machines and rendering actionable insights and knowledge reports to users situated across the globe. IPF provides a real-time view of cost, quality and productivity related parameters, extracted, analyzed and reported in a hierarchical manner to all stakeholders. Integration with ERP: IPF's ability to integrate with any enterprise level software enables easy data flow without manual intervention, ensuring error free and real time data exchange, and eliminating duplicity and redundancy. IPF caters to the requirement of the organizations and provides customization in order to reflect the metrics and reports that are important to each sector or unit. 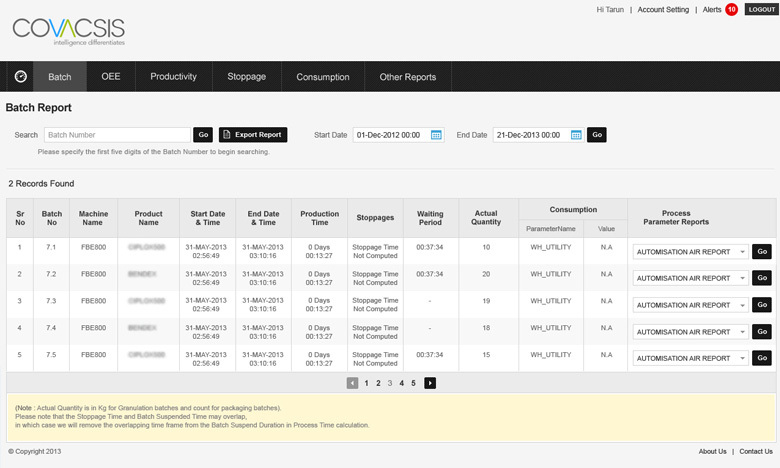 On the fly data slicing gives the user an exploratory experience to derive deeper insights of the shop floor. 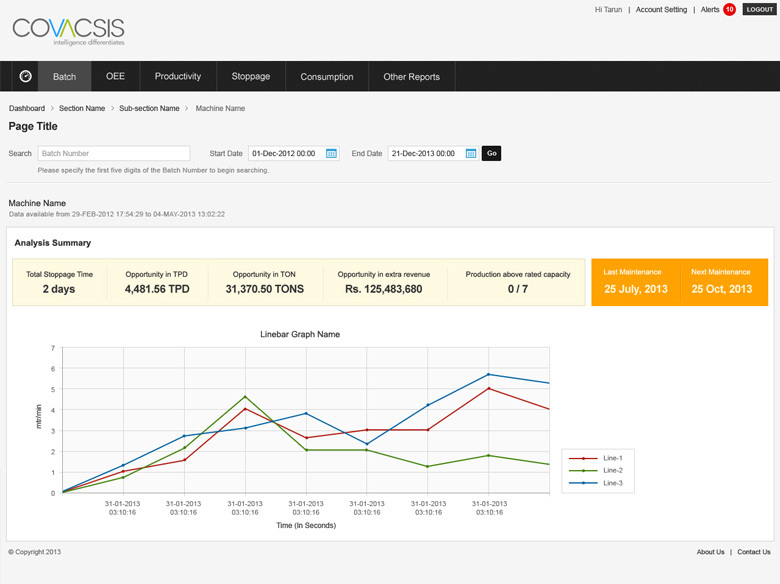 Omnipresent Visibility: The state of production floor can be viewed from any location/device (desktop, laptop, tablets and even smartphones) through customized IPF Dashboards. Financial Impact Analysis: IPF provides interpretation of contribution of shop floor events to top line and bottom line, as it has become a necessity to understand the importance of using shop floor economics to drive operations. Downtime Analytics: Unscheduled break/s are often a reason for lower productivity of operations. IPF identifies and maps time period of these unscheduled break/s in operation and points out the exact duration and reasons for the break which is crucial in improving productivity. Utility Consumption Analysis: Utilities are one of the biggest costs associated with the shop floor in any sector. IPF provides a multidimensional analysis of utilities in a granular fashion which offers a deep insight into calculating and reducing utility consumption. Real Time Alerts: IPF provides the facility of real time alerts about deviation in processes which require strict adherence to tolerance bands or limits to ensure quality, once they have crossed the critical parameter/s defined. These alerts prove a vital tool for the production team to take immediate remedial action to prevent damage or loss in production quality. Machine Capacity Analysis: IPF helps in discovering hidden capacity by providing comparison between actual and expected production levels and reasons for deviations (if any). These comparisons help in freeing up available machine time for production leading to increase in actual production. Historical Analysis: IPF allows quick and easy access to historical data gathered from different machines, batches, SKUs on the floor for comparison and analysis purposes. 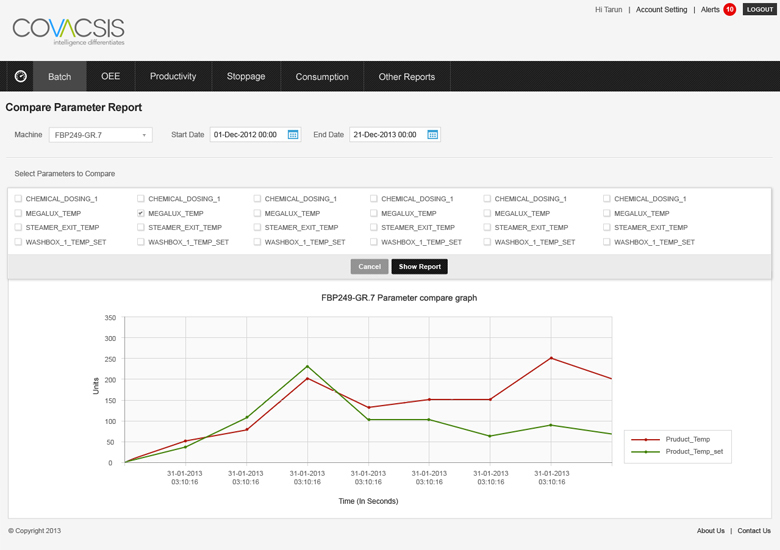 Benchmark Analysis: IPF renders tool for Benchmark Analysis for measuring current performance of operations by deriving specific metrics and comparing it with the set standards for continuous improvement. Production Analysis: IPF provides varied suite of production analysis, customized as per the requirement of the specific sector, offering familiar metrics (OEE, Yield, Productivity, Efficiency and others) as well as sector specific analytics related to production. Variance Analysis: IPF gives an in-depth insight of any deviation in set parameters. This analysis allows users to understand the reason/s behind deviation/s that occurred and work towards correcting them. Operator Performance Analysis: IPF assesses capabilities of the operators on the shop floor on shift/day/month basis and provides insight on the need for their further training to ensure that operators are well equipped to run the shop floor efficiently. WIP Inventory Analysis: IPF offers analytics that helps the production team, in real time, to pin point the machine or any other factor for long batch production time and high WIP inventory and thus saving costs and reducing inventory. Infinite Data Tags: IPF does not limit the amount of data tags that can be captured and measured on the shop floor. No Limitation on Users: IPF ensures that all users from shop floor executives to upper management generate value for the organization from the analysis provided by not limiting the number of authorized users who can access the dashboard. Lossless Data Transfer: IPF protocols are designed and optimized for lossless, high throughput data communication. Quick Retrieval: IPF allows access to large amount of data in no time. Scalable: IPF is highly scalable, hence allows easy expansion across production lines, plants and geographies. Disaster Recovery: IPF provides suitable redundant systems which ensure quick recovery of data in case of any accident or disaster. Robust Hardware Infrastructure: IPF is supported by thoroughly tested hardware infrastructure ensuring operation and performance in the most difficult shop floor environments.